There are about 130 miles separating Richmond and Harrisonburg. 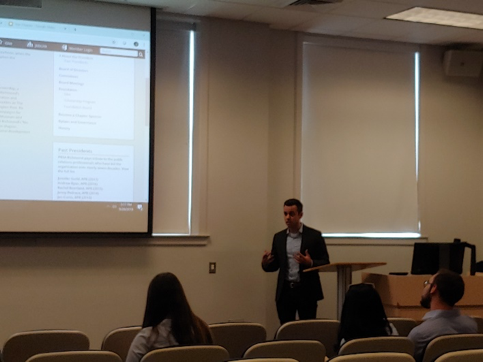 With light traffic, it can take at least two hours to get between cities, but the drive didn’t prevent Virginia Commonwealth University’s chapter of PRSSA from making the trip to James Madison University for the PRSSA Leadership Summit. 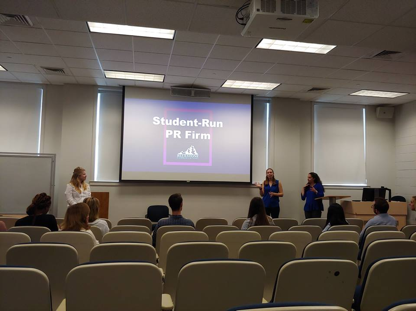 On Friday, Sept. 29, the JMU chapter of PRSSA hosted a Leadership Summit with the PRSA Richmond chapter. The goal of the summit was to encourage communication between the PRSSA chapters sponsored by PRSA Richmond. 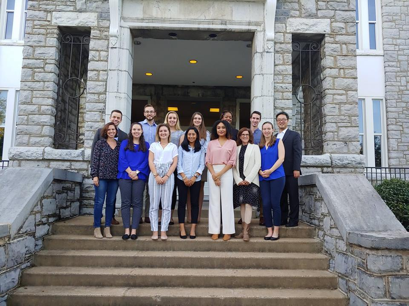 Mama-U Addy, VCU chapter president, Sydney Jackson, VCU chapter vice president, and Judith Crenshaw, VCU chapter met with PRSSA members, student-run firm employees, public relations faculty and professional advisers from JMU. The summit’s schedule was packed with presentations and discussion sessions. PRSA Richmond president, Cameron McPherson, APR, started the summit with an opening greeting to all in attendance. Next, JMU PRSSA members presented about receiving the PRSSA Star Chapter Award. Star Chapter is awarded by the national chapter as a way to recognize a chapter’s activity and involvement. Each chapter must meet eight of the 10 criteria outlined in the application. Criteria include PRSA parent chapter relations, high school outreach and media attention. This year is the third time that JMU PRSSA has received the Star Chapter Award. Then, founding members and executive board employees of JMU’s student-run firm, Bluestone Communications, spoke in the summit about how they started up the firm. A student-run firm is a way for students to get an agency-like experience with real clients. Not only do they create a campaign for their clients, but then they also implement it. A year ago, the founding members for Bluestone Communications got together to lay out the foundations for the firm, including the logo, services, structure and more. In the spring, they launched their pilot semester with 18 students divided among three clients. Now, Bluestone is in its second semester of operation and running strong with double the number of clients. Attendees then divided into two discussion groups. McPherson facilitated the president’s discussion while Isaac Woo, JMU’s chapter faculty adviser, facilitated the vice president’s discussion. Both groups shared their experience on various topics such as recruitment, guest speakers, executive board transitions and elections. After the group session, students also shared their takeaways. Then, all attendees enjoyed pizza provided by JMU’s School of Communication Studies before heading back to Richmond. “I hope this is the first leadership summit event. I mean, I want to see this leadership summit becomes an annual event. Leadership from both schools learned a lot today and we will learn more with students leaders from other schools as well. I truly appreciate that the PRSA Richmond Chapter provided this opportunity,” said Woo, JMU PRSSA’s faculty adviser. The Leadership Summit brought together two chapters of PRSSA to share ideas and strengthen their chapters. One of the biggest takeaway from the Summit is that being a successful PRSSA chapter is not a solo effort. A great chapter isn’t afraid to reach out to the support systems around them. This includes professors, other nearby PRSSA chapters and, of course, their PRSA parent chapter. Moving forward, we hope the relationship between PRSSA chapters continues to grow so that more students can launch their professional career. Julia Smith is a senior studying public relations and journalism at James Madison University. She has been a member of PRSSA since her freshman year and served two years as the director of finance. Julia is also a founding member of JMU’s student-run PR firm, Bluestone Communications. She was the director during their pilot semester and is now the assistant director.